The book is called What Matters Now (PDF) and it’s a quick, wonderful read. I finished it the other day while my students took their final exams. There’s quite a bit of useful information in it. LOL. I wonder what the units of God are? I don’t know what the units of “focused intensity” are, but let’s call them concentrons, for the sake of argument. FOCUSED EATING over TIME multiplied by DOG equals UNSTOPPABLE BEGGING. Hm. I haven’t read or heard much of this Ramsey fellow, but what little I have heard was sensible financial advice. But given the above, perhaps more questioning is in order. I don’t know, I kind of like that equation. It’s saying that your results will be inversely proportional to the amount of time you put in, which sounds almost like a career slacker’s mission statement…but since G = 0, you can try as hard and as long as you like and you’ll get bugger all done so long as you have God in the picture. I leafed (odd verb to use for an e-book) through the book, and I can’t say I found it full of “useful information.” Potentially inspiring advice, maybe. Not really my thing. To each his own, I suppose. As a Math Teacher you should note: The Time in the Denominator means the more time you put in the lessor returns. 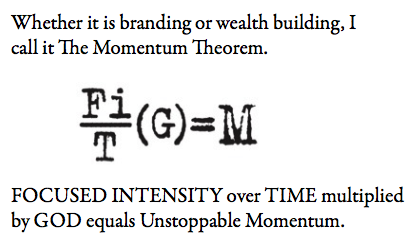 So it’s minimal Momentum, not unstoppable. Hmmm… just to stir the pot… things that are accepted as fact, practiced by people and ubiquitous in effect. Arlo: Do vaccinations and anthropological global warming count. No, they don’t. Vaccines work because they do, based on biological principals that we can use science to understand, not because we believe in them. Same for global warming. The evidence is there. In matters of personal judgement calls, like politics, that overlapping space of questioning is good for keeping your emotions from confusing rhetoric and spin from actual facts. 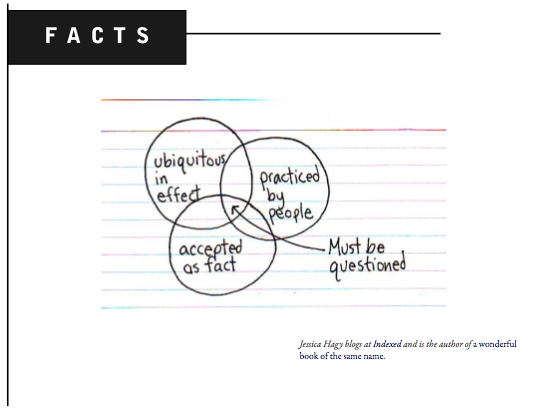 I think what’s been missed in Jessica’s diagram is that it says accepted as fact. Man is a credulous animal. People can accept something as fact without having any rational reason to do so. You can call something a fact with no evidence at all. That’s what needs to be questioned. Ubiquitous effect can be solely based on biases and logical fallacies. Or it can be perceived as real even if it isn’t, like the placebo effect. Once the questioning is done (also known at the scientific method) you have to be prepared to change your view of what is fact and what isn’t. Facts exist whether or not we are around to test them. I have read many of Hagy’s cartoons and I like most but this one I don’t get. 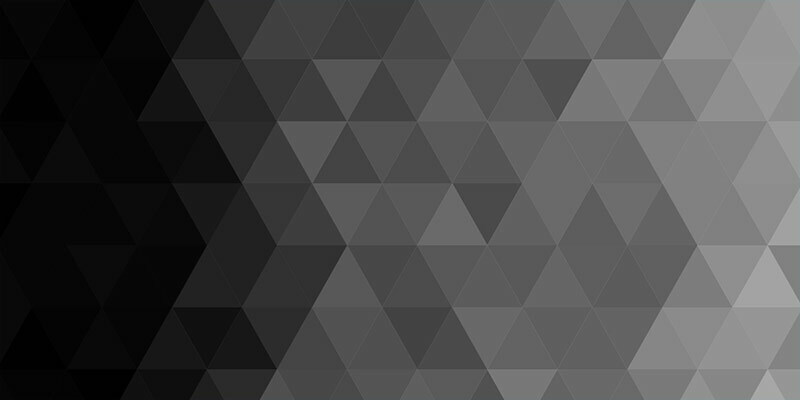 Assuming only the triangle-ish portion items must be questioned, then things accepted as fact and practiced by people but *not* ubiquitous in affect do not need to be questioned. (?) Hmmm… Most everything needs to be questioned in my book (except for the absolute fact that I have the cutest doggies in the world). Bear in mind that Ramsey’s audience is not very sophisticated, and apparently he can get away with just about any little cutesy ditty he wants to put out there, and his target market accepts it without questioning it at all. If Ramsey said it, it makes sense, right? It should be noted also that he’s trolling for customers in churches, then building his little empire out of the wallets of people in financial distress. Is this how a Christian behaves? FREAKING IDJITS over TIME multiplied by GOD equals MALARKEY. TACO BELL over TIME multiplied by IMPORTANT MEETING equals TERRIBLE EMBARRASSMENT. MCDONALDS over TIME multiplied by GOD equals DEATH. Wow, this equation is so simple! Isn’t the equation correct, though? If you spend more time focussing on god, not a lot of momentum will come out of it. Unstoppable Momentum? There’s no “U” in this equation! This is a blatant mislabeling. The correct terms are FOCUSED INTENSITY over TIME multiplied by GOD equals MANIACS. This guy is a financial advisor, and he can’t do basic maths!?!?! No wonder we have a GFC. It’s the Law of Diminishing Returns. Not to mention that anything multiplied by zero is – zero. Love the venn diagram though. Very clever.